First conceived in September 2014 in response to a tweet by Zachary Kaplan, Untitled (Koch Block) is a collaborative public artwork situated permanently at the Metropolitan Museum of Art in New York. 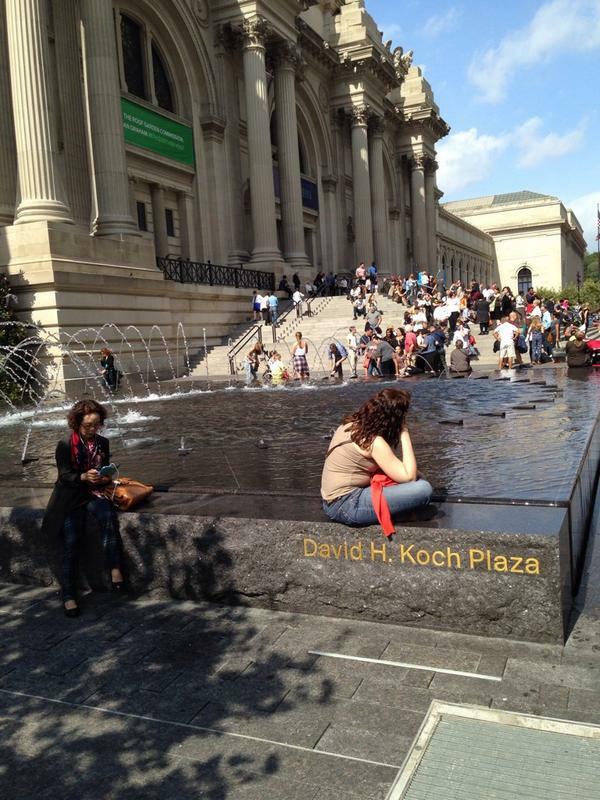 It comprises an endless succession of volunteers who sit on the edges of the fountains in front of the museum in a manner that obscures the engraved name of the museum trustee, David Koch. The work includes the engravings on both fountains, and so is ideally performed by two or more individuals at any time. While a sitter’s personal items such as a stroller, wheelchair, shopping cart, or backpack might be placed in front of the engraving for extra-wide impact, no permanent alteration, damage, or obscuring of any kind should take place, and certainly not as part of this artwork. Any one individual or group should feel free to sit and block public view of the name for as long as they wish, but all should be mindful of others who might also wish to participate. The Artist Is Present-style marathons are discouraged. Instead, try taking turns, coordinating, and/or making arrangements onsite to continue the work. Formalized schedules or shifts should also be avoided, even if this means the work is not persistently instantiated. It’s true that awareness of the work could be facilitated by people posting photos on social media using a hashtag like #KochBlock. My concern, though, is that viral messaging might run counter to the essential nature of the work, which is to deplete the mindshare and social capital that typically accrue from such purportedly eleemosynary naming opportunities. Still, such efforts are obviously beyond my control, and if the 7 million visitors to the Met each year decide they all have to post #KochBlock selfies, well, we’ll re-evaluate. UPDATE: Just realized this is my third piece at the Met. Thanks for the support! Next Next post: Destroyed Derek Jarman Capes: Are There Any Other Kind?